The background to the Texan Revolution is simple. Mexico had allowed American immigrants to settle in relatively remote and empty Texas. The native population was soon outnumbered by the immigrants, many of whom were from the southern states, so they wanted to continue their practice of slavery even though it was illegal in Mexico. Rapid immigration and the colonists’ growing dissatisfaction with their status as Mexican citizens meant that conflict was inevitable. After a series of confrontations, open warfare began in October 1835, and the rebels had gained control of Texas by early December. Believing that the Mexican government would not be able to respond until spring, attention shifted from building an army to debating whether or not to declare independence. However, Santa Anna moved faster than expected, and his army appeared in Texas in the middle of winter, besieging the Alamo in February 1836. Caught unprepared, the rebels were unable to reinforce the Alamo, which fell after a thirteen-day siege. When the garrison of the fortress Goliad was captured and executed two weeks later, Sam Houston, recently appointed commander of the Texan army, ordered a retreat, which became known as the Runaway Scrape as thousands of Texans fled towards the US border. 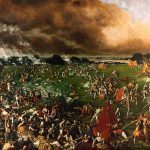 Confident that the revolution had been broken, and eager to win more glory, Santa Anna rashly advanced with a small part of the army to deliver the final blow, but suffered a surprising defeat at San Jacinto on April 21. Captured after the battle, Santa Anna signed a treaty recognizing the independence of the Republic of Texas. 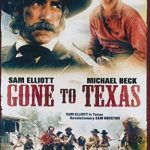 After Stephen Austin (Patrick Duffy) starts his first colony in Texas in 1821, Jim Bowie (David Keith) convinces his friend McNab (Daragh O’Malley) to emigrate to Texas. Benito Garza (Benjamin Bratt), a Tejano, breaks horses and sells them with Mattie (Chelsea Field), an early colonist. McNab and his friend Xavier marry Benito’s two sisters. Romance develops between Maddie and Austin but he is bound by duty, so their relationship remains platonic. Benito has fallen for Mattie but she views him as a friend, and resists his advances until he gets his shirt off. When Mexico ends legal immigration, the more hot-headed colonists want to revolt, but recent arrival Sam Houston (Stacy Keach), former governor of Tennessee, promises to keep the more aggressive colonists calm until Austin agrees to revolt. Thrown into prison when he lobbies Santa Anna for more rights for Texas, Austin is finally released, but has become disillusioned with Mexico, so he wants a rebellion. Benito enlists in the Mexican army, but Mattie sides with the rebels. After capturing both the Alamo and Goliad, Santa Anna sends most of his army back to Mexico and divides the remaining 1500 men between himself and General Cos. Learning that Cos has been delayed by the destruction of a key ferry, Houston attacks at San Jacinto, catching the Mexican army having a siesta, while Santa Anna is preoccupied with a young woman. Although Santa Anna frees Texas in exchange for his life, Benito refuses to surrender, and raids in Texas, retreating to the other side of river outside of Texan jurisdiction, but Texan Ranger Otto McNab (Rick Schroder) crosses the river for a showdown with his uncle. Meanwhile, Houston has become president of the Republic of Texas, and struggles to ensure that Texas is annexed by the United States. The miniseries presents the history of Texas from the establishment of Stephen Austin’s first colony in 1823 to the annexation of Texas by the United States in 1846. Immigrants have to become Mexican citizens and accept baptism as a Catholic, but the script correctly shows that some priests had a very loose attitude towards conversion. When Mexico ends American immigration, many colonists are furious, but Austin points out that Mexico is recovering from a violent revolution and mistrusts its expansionist neighbor, which is a faithful description of the situation. Austin won’t join a revolution but is unable to stop the hot heads, so a new leader is needed. Cue dramatic music and the arrival of Sam Houston, who is given a very heroic portrayal, refusing to become a Mexican citizen out of religious principle, even though the real Houston quickly found an understanding priest, who did not inquire too closely about his religious beliefs. Once he had become a Mexican citizen, Houston started a law practice, where he primarily served as a character witness for recent immigrants applying for citizenship. Furthermore, Stacy Keach’s version is considerably more functional and sober than the real man. Apparently, men who married Mexican women received more land, but few of the colonists married local women, partially because there were so many colonists, and they outnumbered the locals. The script focuses on Texas and does not mention the several states that had revolted against Santa Anna. More important, the writer fails to even refer to the many confrontations, shootouts, land speculation or slavery that led to the revolt. In fact, not a single black person appears in the entire movie. The actual Texan Revolution receives little time in the miniseries, and most of that time is devoted to the siege of the Alamo and the battle of San Jacinto. While the battle of the Alamo is relatively accurate, the massacre of Goliad’s garrison is changed. Instead of being executed after losing a battle, the men are massacred shortly after they surrendered and marched out of the fort. The delegates to the independence convention did not know about siege of Alamo, so Houston forces the convention to vote before relieving Alamo. Actually, the vote on independence was fast and had been completed before news arrived of the siege of the Alamo. The portrayal of the battle of San Jacinto is sanitized, ignoring the widespread slaughter of Mexican soldiers by Texans determined to avenge the men executed at the Alamo and Goliad. However, it is an accurate presentation of Santa Anna’s capture. Mexican prisoners stand at attention when Santa Anna is brought in, revealing his identity, and he accepts Houston’s offer to spare his life if he orders his troops to leave Texas. Admittedly, the miniseries covers a period of about twenty-five years, but it did not need to be three hours long. The script keeps jumping forward in time but there are no transition scenes to show that time has passed, as if the editor forgot to put the dates in the film. The script is not great, but it is better than the actors. Austin’s dialogue sounds like it was taken verbatim from journals or speeches of the time, so it is jarring when compared to the dialogue spoken by the other characters. Often the voice of reason, he is portrayed as weak and his dialogue is too flowery, which weakens his role. Benjamin Bratt brings a spark of life to his character, but John Schneider is a limp, bland Crockett, damaging my memory of him as Bo Duke. A miniseries shown on the ABC network, the production lacked the budget required to recreate the battle of the Alamo, so the producers simply re-used footage from John Wayne’s movie The Alamo (1960). To be fair, the goal of story is good, showing the Tejano perspective through Benito, including the racism of many of the colonists towards the Tejanos. Benito’s family used to own much of the land claimed by the colonists. I think the relationship between Maddie and Benito is supposed to show the culture clash. While the script deserves credit for showing the reaction of the native Tejanos to the American colonists, the acting makes the miniseries hard viewing.